All prices quoted here are in Canadian Dollars. $1 CAN = $0.72 US = €0.61 Euro = £0.44 GBP approximately (May 2003). 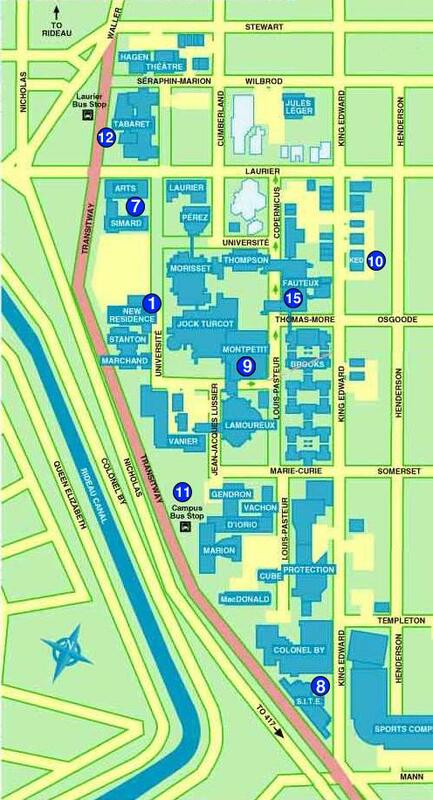 The Summer School Courses will be held in the Fauteux Building, Room 361, marked number 15 on the campus map. The Quantum Workshop will be held in the Arts Building, Room 257, marked number 7 on the campus map. The other workshops will be held in the SITE computer science building, marked number 8 on the campus map (room numbers to be announced). Phil Scott's Ottawa Restaurant Guide has been taken offline. 10 PC's have been set aside for summer school participants. The PC's are located in room 142 of the Montpetit building which is located at 125 University Street (number 9 on the maps). Participants should go to the Help Desk (located at the same place), present their conference badge or name tag and they will be allowed access to the lab. A guest account will be provided. From the airport, by taxi. The ride costs about $25. From the airport, by bus. From the airport, take bus 97 to the "Laurier" bus stop. From there it is a short walk to campus (see the area map below). The bus ride takes about 20 minutes. Buses run every 15 minutes during daytime. The fare is $2.50, and you should have exact change. You can find the #97 bus schedules here (careful if arriving on the weekend: click on "Saturday" or "Sunday" for weekend schedules). For your orientation, you can also consult the transitway map on the right. From the train station, by bus. The instructions are the same as "from the airport", except that you take bus 95 from the train station to the "Laurier" bus stop (number 12 on the campus map and area map). The ride takes only about 10 minutes. You can find the #95 bus schedules here. By car. From highway 417 (Queensway), take exit 118 marked "Nicholas St". This will put you on the below area map. Parking in Ottawa can be difficult, so if your hotel does not offer parking, you might want to consider using a parking garage. The dormitories offer parking to guests at an additional charge. On the right, you see a map of the area surrounding the University of Ottawa. Please click on it to see a full-size version. The University Residences (New Residence) are on campus, at 100 University St. They are marked number 1 on the area map, and also on the campus map below. Phone: 613-564-5400 (dial 0 for operator). Website. Ottawa House Bed & Breakfast. We highly recommend this charming bed & breakfast. Address: 264 Stewart St. (marked as number 4 on the map). Phone: 613-789-4433. Website: www.ottawahouse.com. Gasthouse Switzerland Inn. Address: 89 Daly Ave. (number 5 on the map). Phone 613-237-0335. Website: www.gasthausswitzerlandinn.com. Ramada Hotel & Suites Ottawa. Address: 111 Cooper Street (number 2 on the map). Phone: 613-238-1331. Fax: 1-613-230-2179. Email: ramada@ramada-ottawa.com. Website: http://www.the.ramada.com/ottawa07853. Novotel Ottawa Hotel. Address: 33 Nicholas Street (number 3 on the map). Phone: 613-230-3033 or 1-800-668-6835 (Reservations worldwide-no charge dial). Website: www.bestlodging.com/sites1/17534/index.shtml. There are two youth hostels located 5 minutes from campus. Rates are about $25 per night ($20 for HI members) for a shared dormitory room. Private rooms are more expensive (about $55). Ottawa Jail Youth Hostel. This youth hostel is in a former prison. Address: 75 Nicholas Street (number 13 on the map). Phone: 613-235-2595. Fax: 613-235-9202. Website. Sandy Hill Youth Hostel. Located in a former convent, this youth hostel was opened only last September (number 14 on the map). (Note added in June 2004: this Youth Hostel no longer exists).